If you’ve logged into your Quote Roller account within the last 24 hours, you’ve probably noticed some changes. In response to your feedback (keep it coming!) we’ve made a round of updates to Create a Proposal and to Use a Template. Then, we’ve condensed the whole process into four easy steps. So let’s jump right in, to look at the screenshots and walk through the new steps together. And remember, keep that feedback coming! We really are here to listen to your thoughts, working together to make this app better each week. In response to client feedback, we’ve changed this up a bit in the hopes that it will allow you to send out your fantastic business proposals more quickly. Updated Step 1: Step 1: Choose a Template and Step 2: Assign Name and Contact are both combined now into a new Step 1. 1. Blank template: Similar to Create a Template. Now, in response to the demand for simple proposal options, you can even just do the pricing, add the price block and there you have a simple quote or estimate. 2. My Templates: Of the templates you have created and saved in the past. 3. All Templates: Listing all of the public templates within the Quote Roller template library. 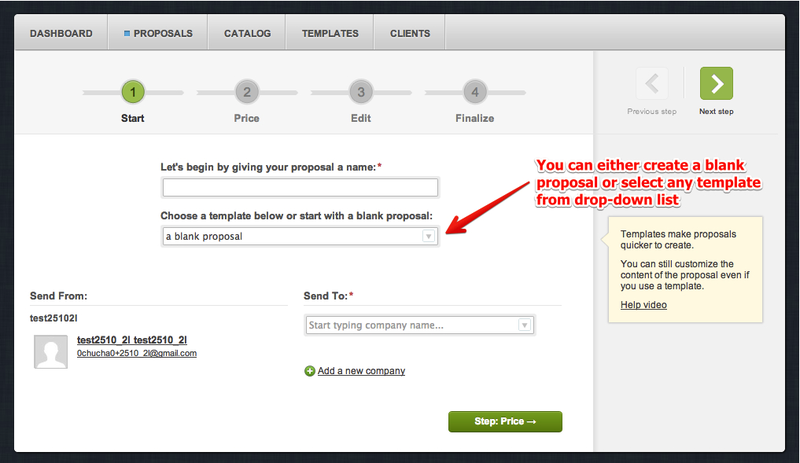 Now you don’t have to leave your proposal creation to add a new company or client. If you click +Add a New Company, a form will open right within Step 1. Then you may +Add New People to the company However, the first contact you added remains the main contact. You may modify that later within My Clients. Step 2 is now the Pricing Table. Other than that, it’s the same. Step 3 is now the Edit table. 1. +Add a Section. Then give that section a title. Now, Finalize is called Step 4. The Email Message to be sent to the client is now at the top. Before the December 4, 2013 update, there were four buttons. The “Preview the Proposal” button remains the same. 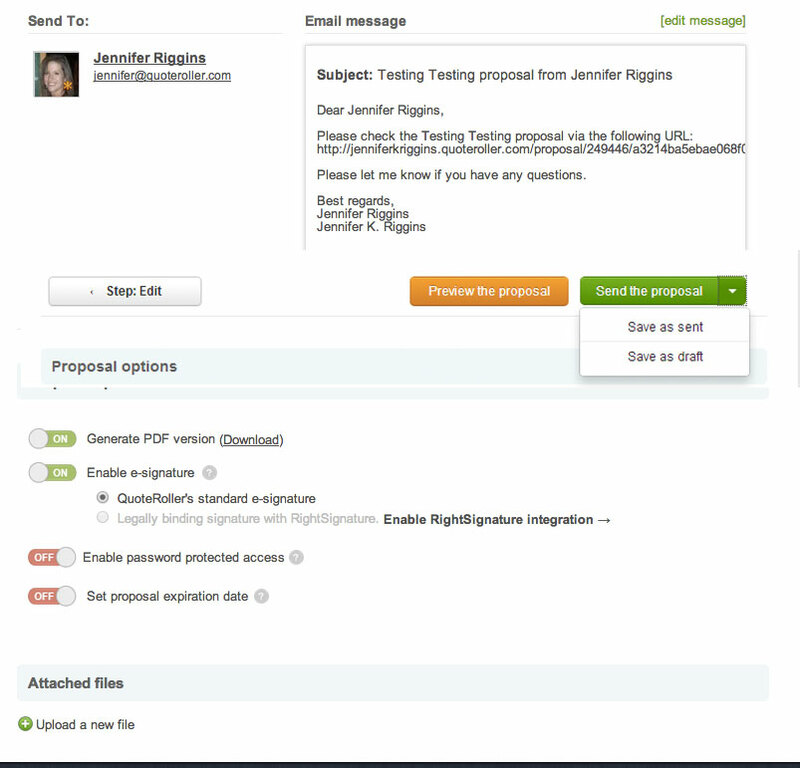 “Save as Sent” and “Save as Draft” are now found in the drop-down menu to the right of the “Send the Proposal” button. Next, you will find the Proposal Options and Attached Files below, but only their location has changed. HOT TIP: Don’t leave yourself without a face within Quote Roller. 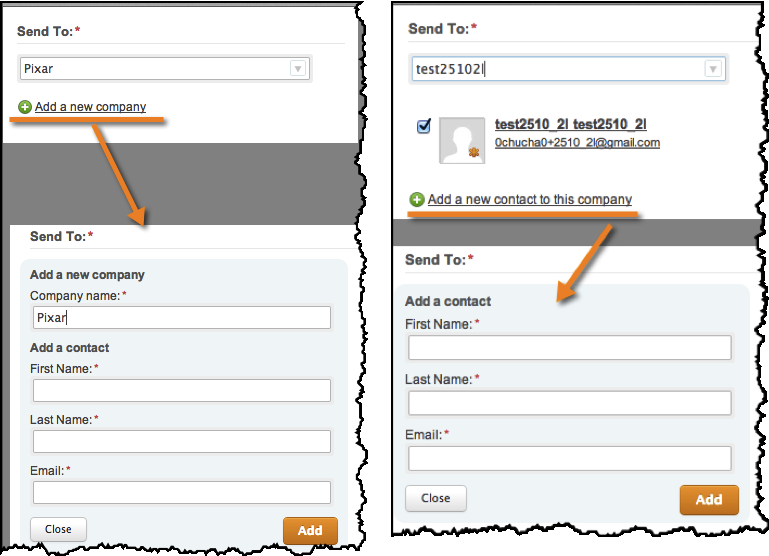 You want to have create a Gravatar for the email address you have registered with your Quote Roller account. Once a template is created, you can use that template to create a proposal, saving you a couple steps. Instead of clicking Create a Proposal and then choosing a template, now you can go directly into Templates, choose your template, then use the green button “Use this Template.” Here we’re hoping to save you a few steps. HOT TIP: After you create your first proposal within our wizard, we actually recommend creating templates because it will allow you to save time in the long run because you will be able to reuse everything.